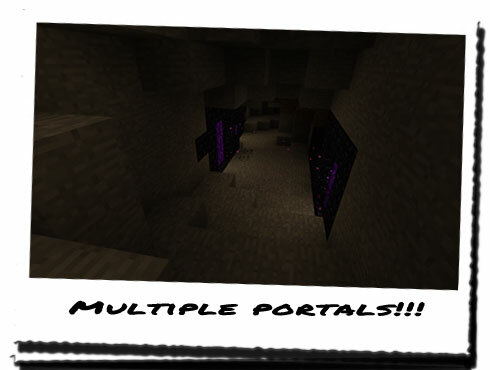 Diary of a Miner: Portals galore! From the edge of the hill where the entrance was, we were able to see the beginnings of the ice shelf that bridged the necessary gap between landmasses. We were going to have to cross that now to get to the other side, otherwise our entire journey would have been pointless. THEROS had verified that there were no other crossing routes or options, so we would have to hope that the ice stood up to the test of three people walking across it. UOPETA decided that walking in a staggered line going across would help to evenly distribute our mass; going across in a grouped bunch and in a single line would concentrate our mass in a single place, and put unnecessary pressure on any thin parts. We would have to be careful and establish a series of rules before we stepped onto the ice. That was one of them. Another was to call across to others if we found sufficiently thin patches of ice, and so it would be UOPETA's job to inform us. He was the fastest so he was likely to react the quickest in the event of cracking ice. We also had to steer clear of the edges of the ice, where it was likely to be at its thinnest, and away from any isolated pools of open water. 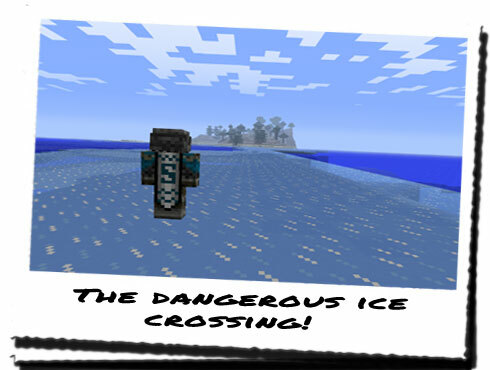 Looking at it before, the ice crossing presented a beautiful method of getting from A to B, but now it posed a highly dangerous threat to all of us. UOPETA set off across the ice first, with THEROS following a few seconds shortly after, to the left a few metres, and then I followed THEROS, but a few metres to the right of UOPETA's path. We created a staggered 'V' shape which should help to reduce the stress on the ice overall. "Everyone tread carefully! It's not just worrying about breaking through the ice; we also need to ensure we don't slip over. The momentum we would accumulate in falling could be enough to break the surface. Walk flat footed, and don't drag your heals! You should be fine!" By walking normally, I had noticed a slight amount of slickness between the surface of the ice and my foot, but after beginning to walk by placing all parts of my foot down at once, there was considerably less movement. I was going to suggest sliding our feet across the surface, but that would only be inviting the possibility of a fall. The snowy hills and trees loomed ahead of us as we drew closer to the end of the crossing. THEROS had been told not to distract himself with the map whilst on the ice; and distractions could prove fatal, so before heading across, we determined that the next location was on the far side of the ice, hidden within a small snowy area. 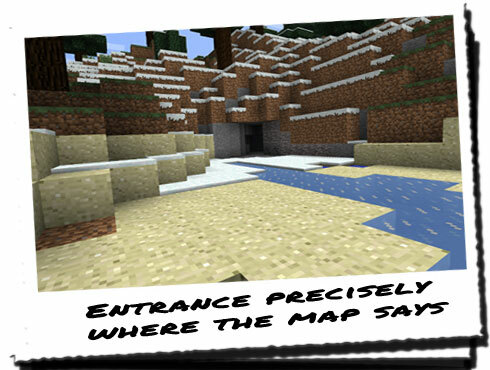 That meant there was no need to take the map out again until we were safely across the other side. No problems... Yet... No, wait I didn't want to jinx it. No problems, at all! Fifteen minutes later, and with no accidents or slip-ups - no pun intended - we reached the end of the ice crossing, and celebrated not dying! "Right, now you can look at the map THEROS. It should be close by, I think it was to the North of this hill..."
THEROS looked at the map and related it to where we were, before nodding. "Yes, that's about it. Just up to the North here and around the side. Let's hope it's on the surface so we can destroy it and move on. I'm not a fan of the cold." Heading into the small cave entrance, THEROS once again led the way, placing torches around. Within a few minutes, and within a few metres of getting into the cave, we realised this was going to take longer than expected; there were multiple entrances, passages and larger caverns all over the place, with none of them indicating which direction to head in. THEROS took the glowing stone out, which was glowing a brilliant orange, proving the existence of active portals close by. THEROS span around on the spot, staring at his hands, before settling facing one particular passage. "I think it's this way..."
"The stone glowed slightly brighter when I faced this direction. Only slightly... But enough..."
THEROS led the way, showing almost excitement as the stone grew brighter and brighter within his cupped hands! We had to hold him back every now and again, as on a few occasions he almost walked straight off a high drop. After many seemingly random twists and turns, we came to a corner where we could hear portals before we even rounded it! Turning the corner, we found that we were right. But better yet, we didn't realise how right we were. Around the corner, against either side of the walls lining the passage where multiple portals! There were four in total; two active secondary portals, an active standard portal and a half destroyed one. "Looks like we hit the money shot!" THEROS rushed forward and placed the stone on the base of the first portal and stood back. The portal collapsed in the standard fashion, before THEROS retrieved the stone and moved on to the next one. Within five minutes, all of the portals were destroyed, and I had removed the remainder of the frame from the partially destroyed one. "Looks like we're done here. I hope you can lead us back out of here THEROS." THEROS picked up the stone from the floor, but remained standing still for some time. UOPETA looked at him, a little confused. "THEROS? Come on, we've got to go!" We looked at THEROS, who was in turn looking into his cupped hands again, and we realised what he was looking at; the glowing stone had reached the usual shine as it usually has, and exceeded this, continuing to grow brighter and brighter. "We're not done here. There are more portals close by."